Santa Marta is where Colombians go to have the sun on their backs and rum in their glasses- so Lonely planet says. Sounds like a tropical paradise right? Wrong! Santa Marta to me is an ugly, dirty, dusty town (city?) that is hot, humid and very unpleasant to look at. Should you ever find yourself in this ugly place make sure you stay at the Drop bear hostel. Owned by an Aussie expat, this awesome hostel is a former drug cartels mansion. It’s pretty cool being there trying to imagine what everything was used for before it was transformed into a hostel. Ok, maybe I am being a little harsh on Santa Marta. It is the perfect gateway to some awesome spots surrounding it. After two days of lazing around the pool, watching the locals swim amongst the trash in the dirty beach and meeting the Australian record holder for free diving, we packed our day packs, left our big bags in storage and caught the local bus 1 hr to Costeno beach surf camp. 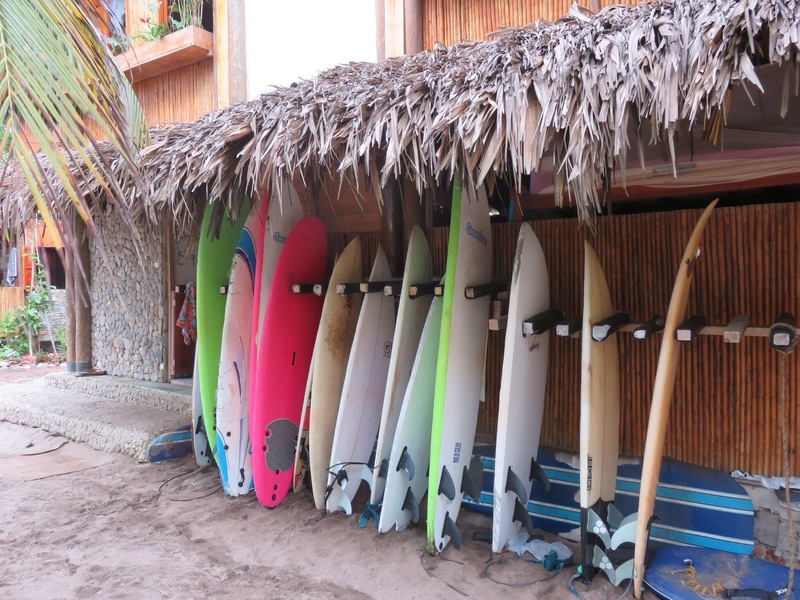 I read about Costeno beach surf camp in a travel blog ( I can’t remember the name of it, sorry) and it sounded like a cool place for me to relax and for Tom to surf. It also sounded pretty remote and gave us a long list of instructions of how to get there and what to tell the bus driver. Even after telling the bus driver 6 times (we counted) and confirming with him that we wanted to get off at Costeno beach we drove at least fifteen minutes past it. He kept telling us it was five more minutes away and then tried to make us get off at some other random place. It was then that he laughed and realised he had misunderstood us (six times?) and told us to get on another bus going the other way. So, after paying the next bus driver again, we finally saw the sign. As we got off the bus we met an awesome Aussie couple hopping off another bus heading to Costeno beach too. And just like that, we made new friends! Together, we walked down the dusty road through the jungle, getting eaten by Mosquitos until we reached our destination. There was a slight mix up with Tom and I’s booking (our fault) and we thought we had booked a private room with a bathroom when in fact we had booked a beach hut. The beach hut was exactly that, a little hut on the beach with a curtain for privacy and just enough room for a double mattress and one person at a time to stand in. It was very rustic, but it was awesome! We fell asleep to the sounds of the ocean and left the curtain a little open at night so the ocean was the first thing we saw when we opened our eyes in the morning. For a surf camp, there wasn’t many people there surfing and the waves weren’t that great whilst we were there (so Tom tells me) but it was full of awesome people, friendly staff, lots of hammocks to relax in and AMAZING FOOD. 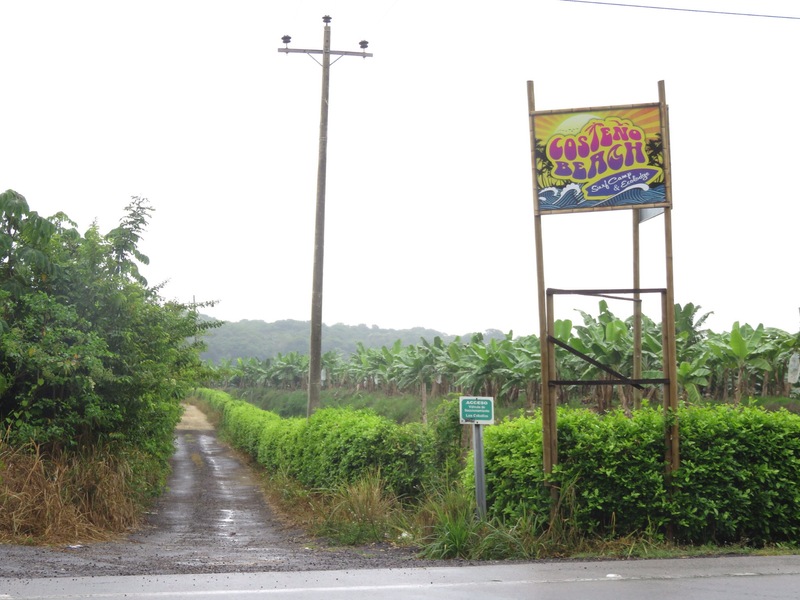 Since Costeno beach used to be a coconut plantation, there are plenty of palm trees and coconuts around. 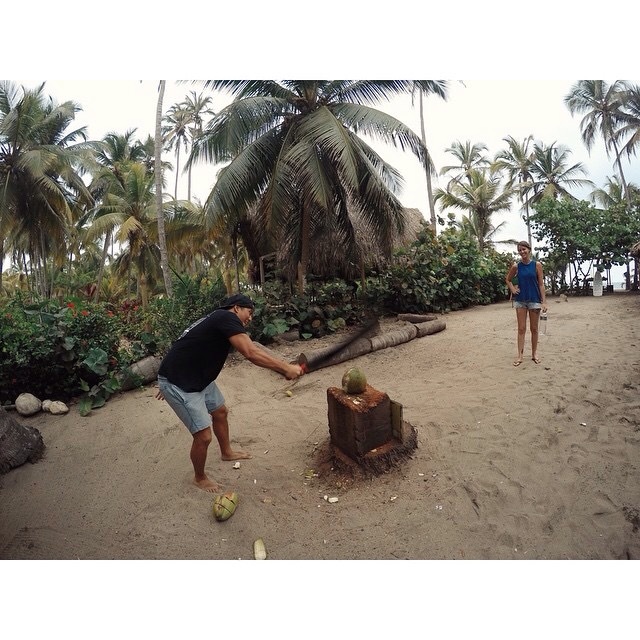 Tom and our new friend Nattu decided to climb a tree and get us some coconuts. It was very amusing to watch. 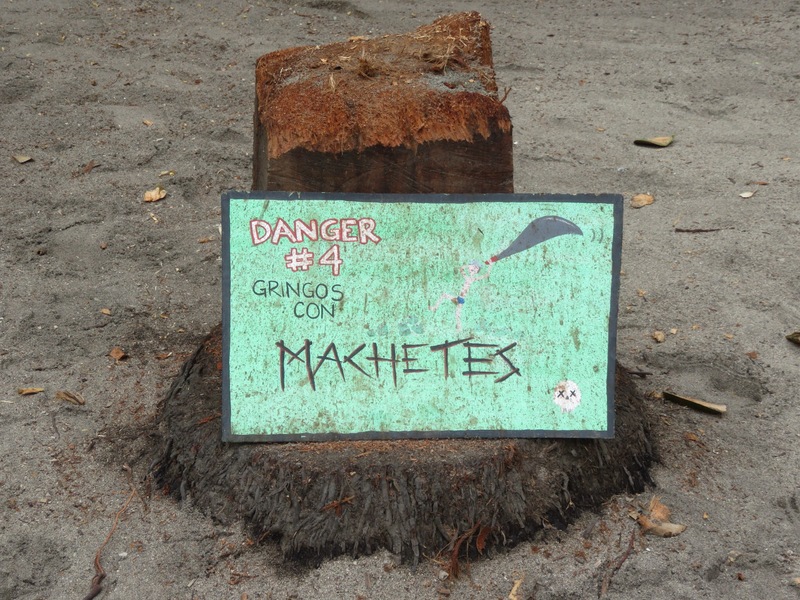 They then cut open the coconuts using Nattu’s machete and we drank the water from them. It was a cool experience. The days were filled with sun baking, reading my book in the hammock, watching Tom, Xanthia and Nattu surf, eating lots of good food, painting coconuts and talking with new friends. Actually, we spent a lot of time talking. 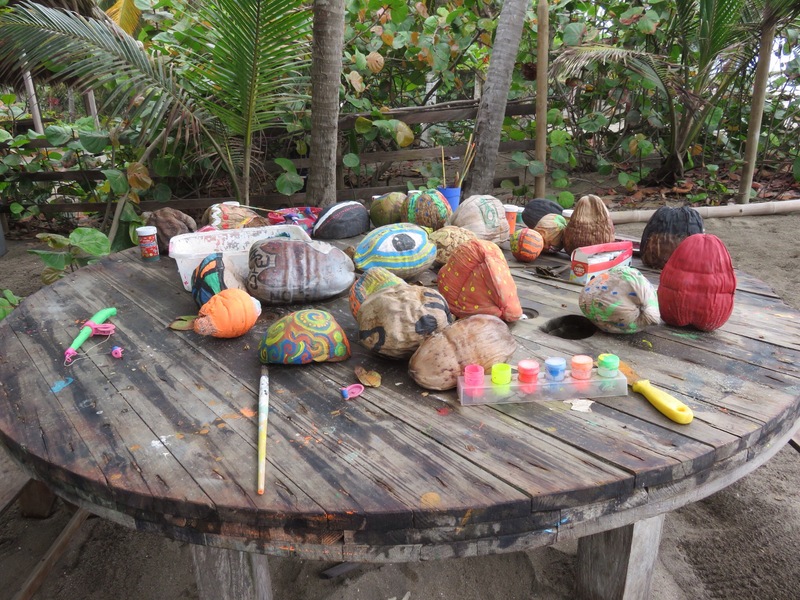 One day we sat at the coconut painting table for the whole afternoon until dark, just talking with our new friends. It was the perfect way to relax and just do nothing. After three days of relaxing and making awesome new friends, we decided it was time to leave. A bunch of us caught the local bus another 45 mins up the road to the town of Palomino. I say ‘town’ but really it was just one street with a few restaurants and food markets. A quick 20 min walk away from the town would get you to the beach..unless you are us, and end up taking a wrong turn and walk for what felt like ages in the heat looking for a hostel. 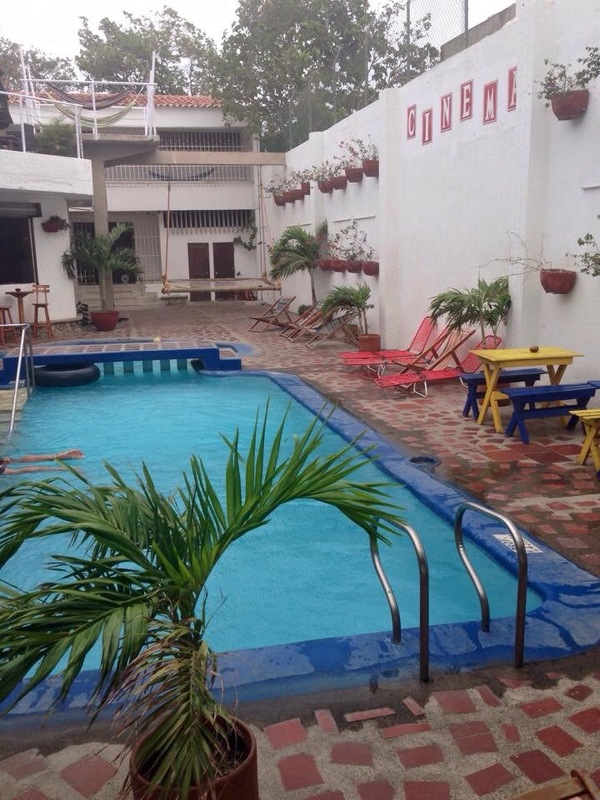 We finally arrived at our hostel called Finca escondida. 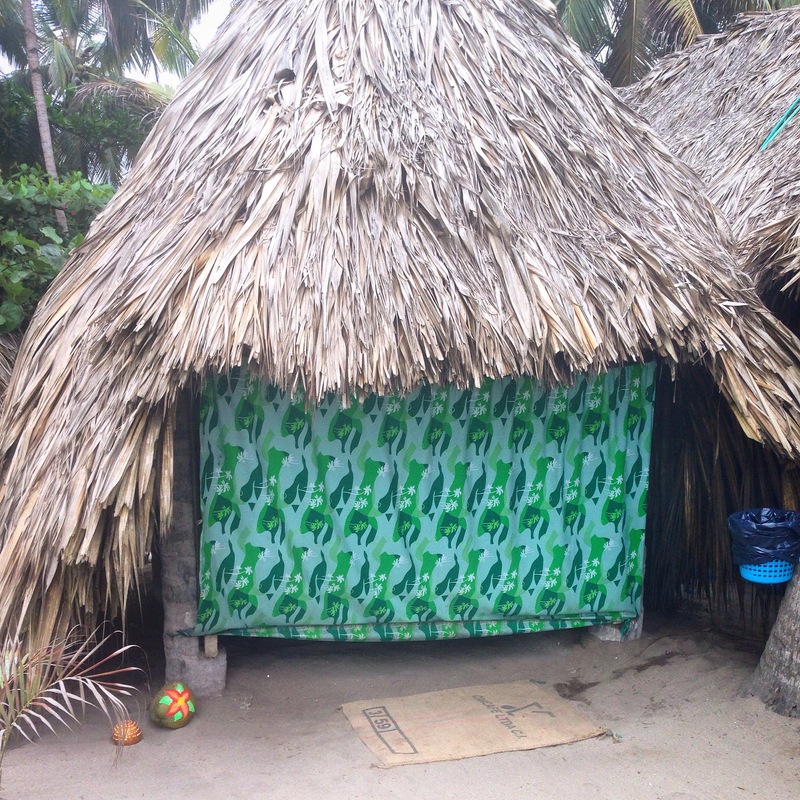 The hostel had a cool chill out/ restaurant area on the beach but the dorms and bathrooms were pretty gross. 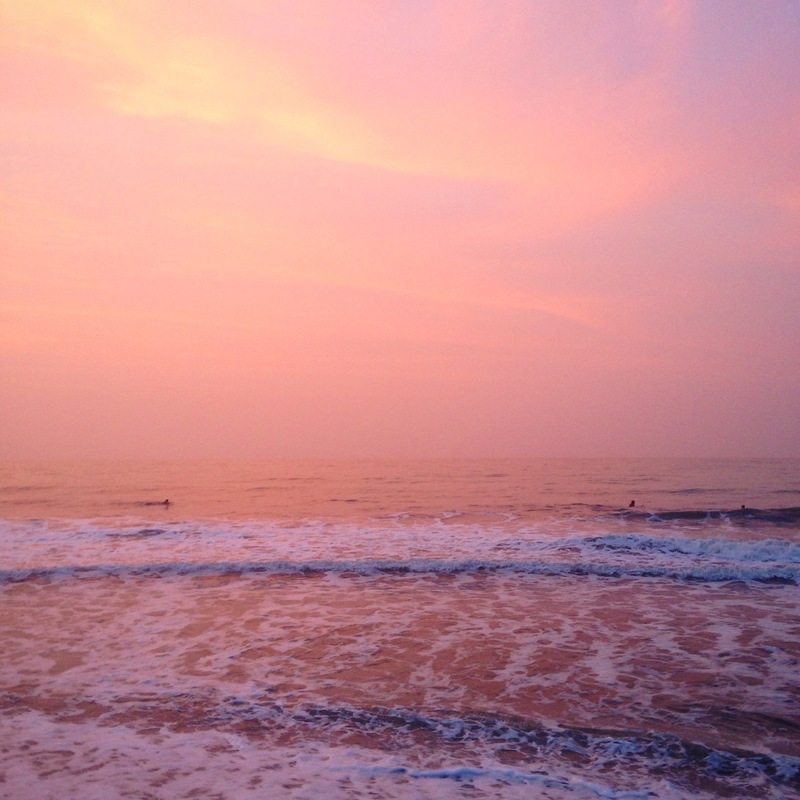 We went swimming, chilled on the beach, saw a beautiful sunset and ate a delicious meal at Tiki hut. 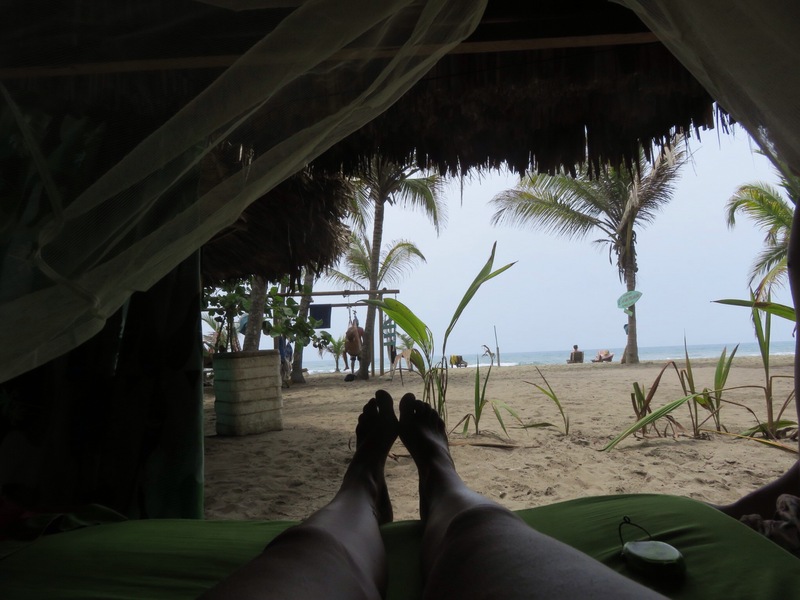 We had all planned to stay here for a few days but since there were no surfboards to rent at the time and we had just spent 3 days relaxing on the beach, we decided to pack our bags the next day and seek out our next destination.